Whiskas Dry meals have been developed to make sure they contain the right amount of essential vitamins and minerals your cat needs to remain healthy and active, even if your cat’s idea of activity is snoozing on the sofa! Cereals (min 4%), Meat and Animal Derivatives (min 4% Duck and min 4% Turkey in the Light Brown Kibbles, min 4% Meat in the Meaty Nuggets Filling), Vegetable Protein Extracts, Oils and Fats, Derivatives of Vegetable Origin, Minerals, Vegetables (min 4% Carrots in the Orange Kibbles, min 4% Peas in the Green Kibbles). 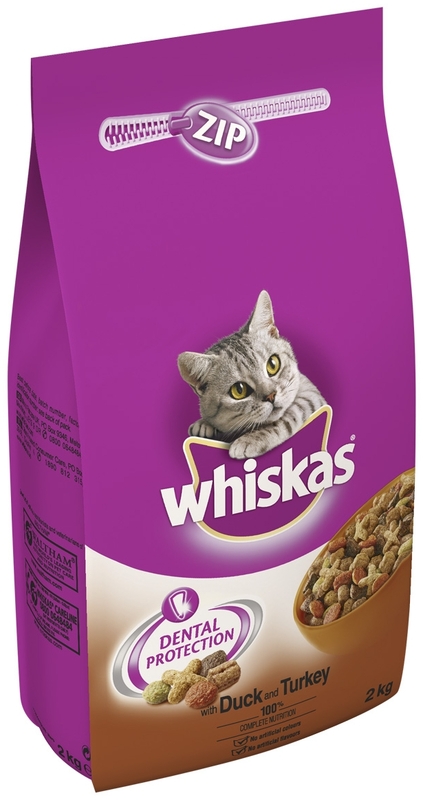 There are currently no questions for Whiskas Adult Complete Duck & Turkey Cat Food - be the first to ask one!